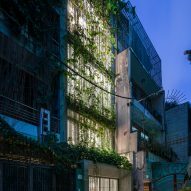 Vo Trong Nghia Architects has covered the roof and facade of Breathing House in Ho Chi Minh City with a canopy of climbing plants to create private outdoor spaces. 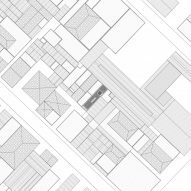 Breathing House occupies a narrow and deep lot within a densely populated neighbourhood that is accessible only via a narrow alleyway. Due to the restricted site, the only surfaces that could be opened up were the front, back and top of the building. 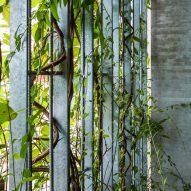 Each of these surfaces then required what Vo Trong Nghia Architects described as "a green veil" consisting of creeper plants growing on a steel mesh to protect the interior. 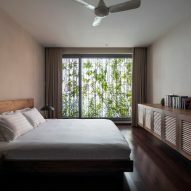 The plant curtain ensures the external space and openings to the outdoors are private areas for the occupants to enjoy. 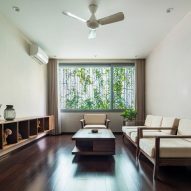 "This soft layer, as an environmental diffuser, filters direct sunlight and prevents the interior space from overexposure to the outside, without the feeling of isolation," Vo Trong Nghia Architects explained. In addition to preventing overlooking, the curtain of plants provides a view of greenery that is visible from every part of the house. Planters at the edge of each floor slab combine with galvanised-steel modules to create an outer facade beyond the sliding doors or windows lining the living spaces. 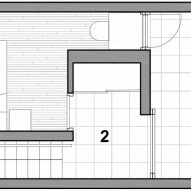 The house has a staggered plan that creates small external spaces described by the architects as "micro voids". 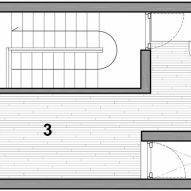 These openings allow natural light and ventilation to reach the open spaces on each level. 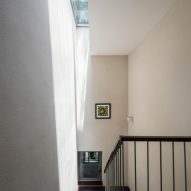 "In the narrow and deep plot shuttered by neighbours on both sides, it is more environmentally effective to promote ventilation for each corner of the house through multiple 'micro voids' rather than a singular large courtyard," the studio said. These carefully positioned openings create views through the various internal spaces towards the outdoor areas. 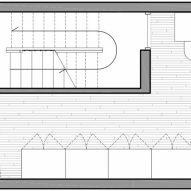 The staircase also functions as one of the voids, with a roof light and openings onto the living areas allowing daylight to filter through. 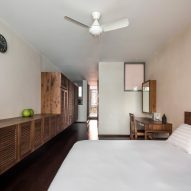 The building is entered through a garage and hall on the ground floor, which also accommodates a guest bedroom with a small courtyard to the rear. 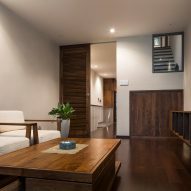 Stairs ascend to a kitchen and dining area on the first floor, which flows seamlessly into the main lounge. 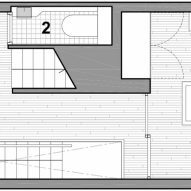 The master bedroom is situated on the second floor, with the children's bedroom on the level above. 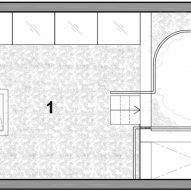 The fourth floor contains a hallways and altar, with access to a rounded terrace. 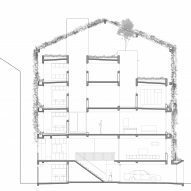 This exterior space is overlooked by a larger roof terrace slotted in beneath the sloping canopy of greenery. 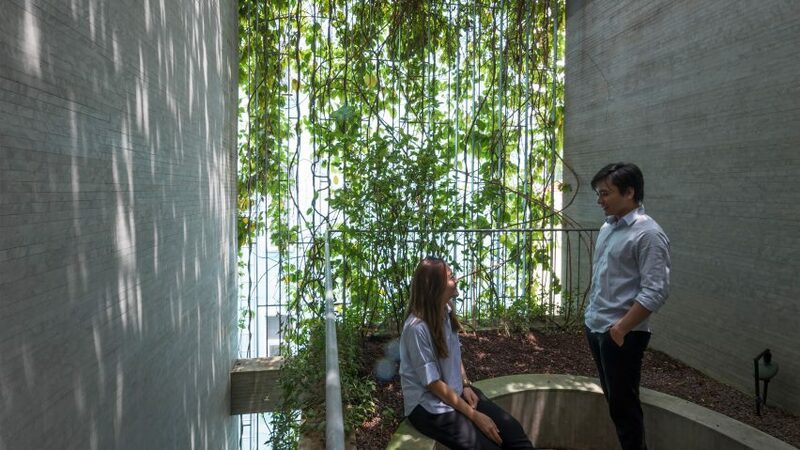 The Breathing House is the latest residential project designed by Nghia's studio to demonstrate how planting can be integrated into architecture to help mitigate the negative effects of urbanisation. Previous examples have included a property featuring stacked concrete slabs punctured by voids with trees growing through them, and a home with bamboo-filled concrete planters covering its facade.